As human beings living in a not so perfect society, we all have our ups and downs. At home, at work, with friends, with spouse, with finances, with health or just with yourself. And, when things are not working out in any of these areas, the going gets really tough for the individual. It is compounded further if the problems cannot be shared due to a fear of damaging one’s social image or other social consequences. Many scientific studies have shown that emotional disturbance can be reduced to a large extent if one speaks it out or shares it with a person who has had similar experiences. A group of 4 former students of IIM Lucknow have created a web destination – Sharingdard.com – that allows people to share their grief, emotional turmoil, anxiety, stress, depression etc. anonymously with others. 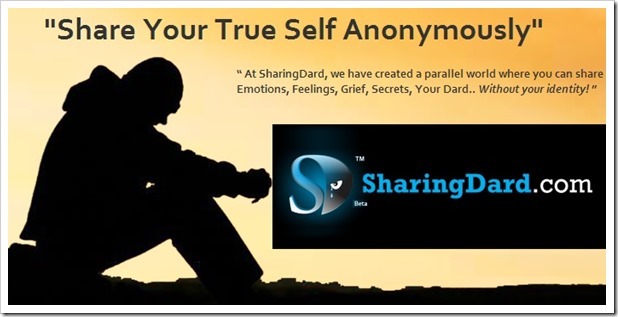 Sharingdard could be termed as a emotional social network, where individuals can not only share their grief, but also respond to others who may be in similar situation. The key aspect about sharingdard is that people sharing their experiences, do not have to reveal their identity while sharing, so they are comfortable sharing anything and everything on their mind, without worrying about anyone else finding it out. The site is well organized where users can share their stories or confessions in 6 different categories including Jobs and Career Dard, Family and Social Dard, Love and Relationship Dard, Social Taboos Dard, Matrimony Search Dard and I Feel Lonely Dard! It is interesting to note that “Love and Relationship Dard” has maximum stories and confessions listed under it. According to one of the co-founders, Ritika Sharma, the site was launched in May 2013, and has already seen quite a bit of traction. They have over 15000 registered users from across 79 countries and have clocked over 2.5 million pageviews till date. Pocket Money Rising: 75% of Indian Youth Spend INR 6000 p.m On Cosmetics, Apparel & Mobile! How Can Angel Investors Add Value To Startups Beyond The $s? Potential Benefits of the Network Effect For Indian Startups! The 10 Things That Every Angel Investor Must Know!